Gallery 4 makes a come back with brand new cars. This a bit of an eclectic selection, but you will notice that most of the cars are from the early 70s back. Does that say something about us as a bunch of nostalgic old foggies??? They include several more great cars from David Lawson and a stunning fictitious livery from Greg. 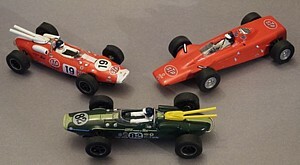 Here is part of David's extensive Jim Clark collection.